Forget about the hot Caribbean! How about a cruise which includes Ketchikan, Alaska? Here's everything you should know about the cruise destination. Ketchikan, Alaska is located at the southeastern tip and is famously nicknamed salmon capital of the world. Ketchikan covers an area of 5.90 square miles. While that might sound small, it’s actually one of the largest cities in Alaska with one of the highest population at approximately 8,000 residents. Ketchikan is the gateway to the inland passage. It is known as the first city of Alaska. It’s the first city you come upon when traveling to northern Alaska. It forms part of the Revillagigedo islands and is one of the most beautiful towns in the region. Ketchikan has four berths and your cruise ship is bound to dock at one of them. However, if there are many ships in port, you might be forced to tender as your ship drops anchor offshore. The cruise ship pier is found right in front of the town and is only separated by a waterfront Melancon. Once you disembark you can quickly get to Ketchikan town by just crossing the streets. 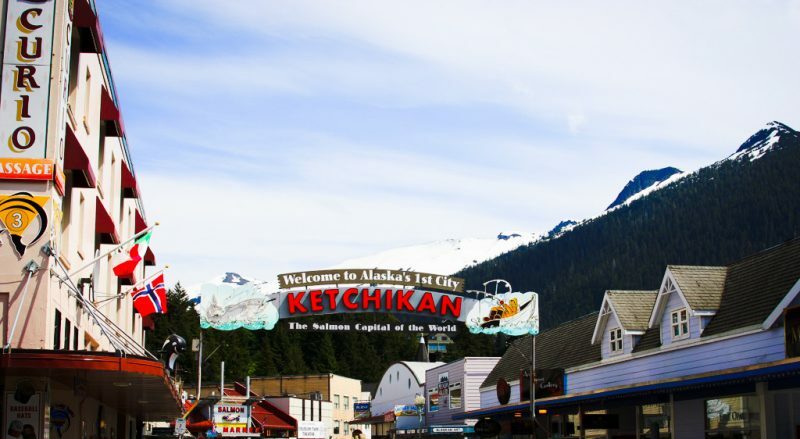 There is a lot to see and do in this beautiful destination but first here is what you should know about Ketchikan Alaska. Get your Ketchikan souvenirs from Amazon over here. Ketchikan was incorporated in 1900 and is named after the Ketchikan creek streaming into the town. It’s popularly known as the first city of Alaska, not because it was the first to get settled on but because it’s the first town you arrive at on a northbound travel to Alaska. The main economic activities of this town are fishing, tourism, and timber. Once at the port there are information desks at the end of the pier, this is where you go to book tours and excursions. Or to meet your tour operator if you booked a tour in advance. Ketchikan is a small town, well maintained with good walking areas. You can explore the town on foot or take the free shuttle at the cruise pier that drops people downtown. If you are looking to take an excursion or venture far afield from the town, there are buses, taxis, boats and flat planes that offer transport. The silver line bus offers rides for $2 roundtrip. Taxis are also available for $3 per mile. Ketchikan has warm winters and cool summers. If you are a sun worshipper then this might not be the ideal vacation destination for you. Ketchikan is surrounded by millions of acres of Tongass rainforest and is almost always covered with clouds. Be inspired and read up on all things Alaska from Amazon right here. It’s the 4th wettest place in the world, receiving over 160 inches of rain annually. It rains 300 days of the year. When cruising to Ketchikan it’s best to dress up in layers and expect any kind of weather. Ketchikan uses both US and Canadian dollars. There are plenty of ATM’s and banks in the town. When in Ketchikan you have to taste the fish fingers chips and chowder dish. Other than that, you can try their famous smoked salmon, king crab, halibut and red snapper. A lot of American food fare is also offered in the place starting with the best burger in town from burger queen. The best salmon to taste on this port is the pink salmon and sockeye salmon. Ketchikan has great shopping. In fact, one of the most popular activities to do in the town is shopping. So come ready to spend and splurge a little. You will love the authentic totem pole souvenirs made in the place, unique merchandise such as far clothes and interesting quilt designs. Different varieties of canned salmon are also available for tasting and purchasing. Not only that but popular tourist shops found in the Caribbean are also available in this port. Get all your Alaskan Souvenirs from Amazon right here. Ketchikan is best known as the salmon capital of the world. Its waters are home to 5 different species of Salmon. Salmon is found in plenty in this town. In fact, the main reason the first inhabitants of the place the Tlingit, Haida and Tshimsian Indians moved here was because of the abundance of salmon during summer. It’s very interesting to watch the salmon swim upstream during summer. They jump to get to the other side of the creek. Ketchikan exports millions of pounds of fish every year to the rest of the world. It’s because of this specialty that the town earned itself the salmon capital of the world. Ketchikan receives rainfall any time of the day. The rain is so sudden at times that it might rain even while it’s sunny and warm. The locals are so used to this phenomenon that they call it liquid sunshine. So, when in Alaska prepare to encounter rain any time even if the sun is shining brightly. Make sure you have the correct kind of rain jackets and cruise wear to keep you warm. Misty Fjords is one of the popular attractions in Ketchikan. It’s a national monument located 40 miles east of Ketchikan. It covers almost 2.2 million acres of the Tongess national forest and is so remote that the only way to access it is by plane or boat. Explore the waterfalls and the lush green of this beautiful place while on a kayak or by a plane. This is an outdoors man’s playground, there is plenty to see, the sea cliffs, glacial valleys, roaring waterfalls, and fjord. Misty Fjord can be compared to Yosemite forest only its larger. This beautiful place is also home to bald eagles, killer whales, bears, deer and sea lions. If you are a nature lover, then visiting this place is a must. Tongass national forest covers 16.7 million acres of land and is the largest national forest in the united states. This forest affords cruise visitors plenty of things to do. Visit this place and try hiking in any of its many hiking trails such as railbird, deer mountain hiking trails. Visit its many lakes and bays and watch several types of bears in their natural environment including the black bear. Or rent a kayak or canoe to explore the marine life. You’ll need your hiking boots when adventuring in the forest. Bears can easily be seen in Ketchikan. The best place to get a good glimpse of them is at Neet’s bay, where you are almost guaranteed to see these majestic creatures. 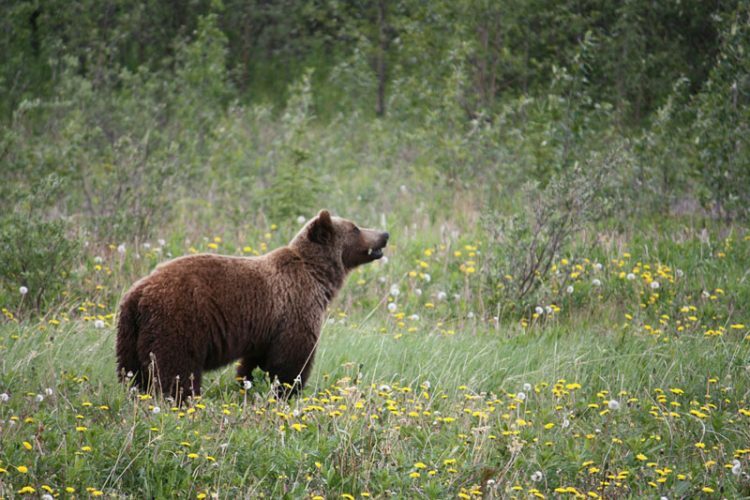 If you are a curious nature lover, then book a trip to this place and have a terrific time observing all types of bears go about their daily lives. The bears don’t attack people, they have too much salmon to care about you. Take a look at all the travel binoculars from Amazon by clicking here. Killer whale watching is a popular tourist activity in Ketchikan. Mostly done in brightly colored kayaks and canoes. This keeps the whales from confusing the vessels with a sea lion. If this sounds like something you would love to do, then book this tour. It’s guaranteed to give you a once in a lifetime experience. The Lumberjack Show in Ketchikan is a must see. Logging is one of the most common activities in Ketchikan. The Lumberjack show gathers lumberjacks in a competition to test their strength and agility. Go see this show and enjoy the axe-tion, as men throw axes freely, climb 50ft long trees, roll logs on the water all this while you cheer for your choice. The show is hosted in a covered arena, with heated and cushioned seats. The lumberjack arena is close by to the cruise dock, located only a block away. Enjoy shopping for unique souvenirs at their gift shop. And also get your snacks for the show at the concession store in the area. Creek Street is the most famous place in all of Ketchikan. It’s the town’s historic district. It’s lined with brightly colored wooden houses. These structures are hoisted up on pillars erected in the creek running beneath. Buy all your cruise accessories from Amazon before your cruise vacation. This place used to be a gentleman’s street back in the olden days and attracted a lot of fishermen, miners and lumberjacks. It’ now however transformed into artsy shops. Take a stroll down this street located just one block away from the cruise dock. Enjoy popping in into different shops exploring and learning about the Alaskan culture. Ketchikan is known for having the largest collection of old totem poles. The totem poles bear sculptures curved on wooden poles or posts. They are not religious but display the history of the place and its key influencers. You can visit the totem heritage site downtown Ketchikan to explore and learn more about these sculptures. Also, visit the totem bight national park. The totem bight national park is located 12 miles north of Ketchikan. The 33-acre park is a historical site that displays native Indians history on the totem posts. You can get there by taking a taxi from the pier or walking into town to catch the northbound, silver lined bus to the park. The trip costs only $1 one way and there is always a pickup or drop off every hour. 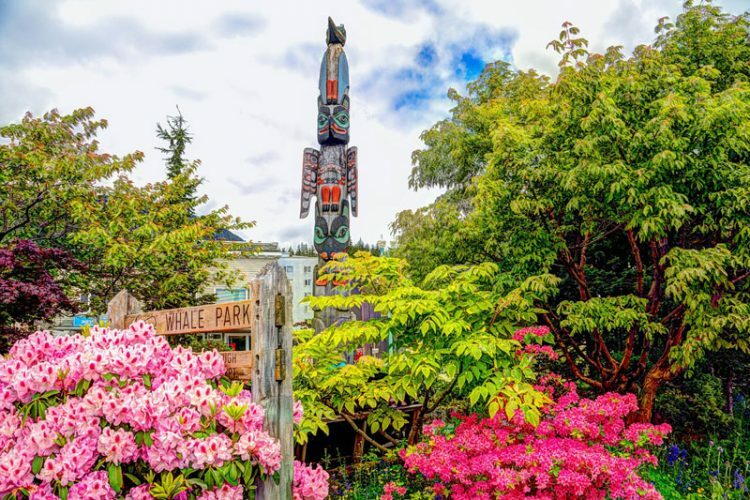 Inside the park, you will have a chance to freely explore the totem poles and even have a close-up view of how the chief of the Indians used to live. The chief’s house is found in the center of the park. 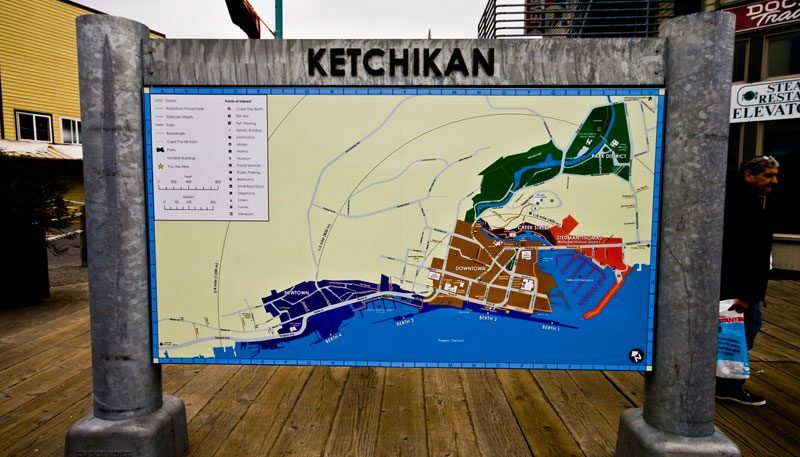 An hour here is enough to explore and learn as much history about Ketchikan as you would like. Sport-fishing is a popular activity in this port. You can not visit the salmon capital of the world and leave without trying to fish. If you enjoy fishing then try fly fishing in Ketchikan. You are almost guaranteed to make a catch under the helpful guide of experienced local fishermen. With an abundance of fish in its waters, you can catch salmons, king salmon, king crab, red snapper and many more types of fishes. Also Read: Check these Alaska Cruise Packing Tips. 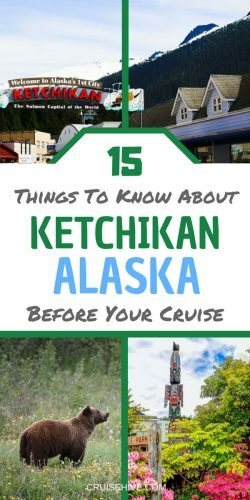 Now that you know what Ketchikan Alaska, is all about you can plan your trip accordingly. Please note that neither words nor pictures can describe the beauty of Ketchikan. As such it’s best you visit the place to experience this phenomenal place. You have to see, smell and experience Ketchikan to understand it’s beauty. The number one recommended way to see this stunning place is via a flat plane. These tours take you to all the attractions and even zoom in to give you closer sneak previews of the wildlife and features of the destination. Enjoy the postcard-perfect scenery, delicious healthy food and the freshest air you have ever breathed. Just don’t forget to carry bug spray, lots of warm clothing an umbrella and your camera. Happy Cruising!! A full guide on when is the best time to cruise Alaska. Providing travel tips and making sure cruisers get to see destinations like Ketchikan and Juneau.